"The Slayer with Flaming Hair and Blaze-Red Eyes" - a business title for a girl who required no name. As a Flame Haze, a being responsible for the protection of reality itself at all costs (even the lives of humans and others of her kind), she was chosen and raised to perform her duties perfectly, taught only those skills which would aid her in her task. Contracted to Alastor, this powerful and well-reputed entity resides inside the girl, advising her through the pendant she wears. But she was not to remain nameless forever. Dragged into the world of humans to protect an important artifact, she meets the 'decaying remnants' of a boy called Yuuji. In contrast to her inhuman treatment of 'it', he gives her the name "Shana". Yuuji was the first of his kind that could calmly accept what 'it' was and its fate to disappear from everyone's memories. This general attitude irritated and baffled Shana to no end. Moreover, she found herself listening to its in-combat advice and insights. Why? 'It' was an insignificant 'object', why was she paying so much attention to it? It was distracting her finely honed fighter's mind. At one point Alastor advised her to destroy Yuuji, but she could not find it in herself to do so. Emotions and Lessons (e.g. the meaning of a kiss) she'd never been taught were surfacing. A love rival appeared, which stirred up more unfamiliar feelings. Her mentor showed up and tried to destroy Yuuji, but Shana's body moved on its own to take the hit for him. Painfully slowly, she learns to deal with the emotions surrounding love and balance her duty as a Flame Haze with her desires as the person named "Shana". Shana is no stranger to rivalries. Her love rival, Kazumi Yoshida, has pushed her to strive for Yuji's love. 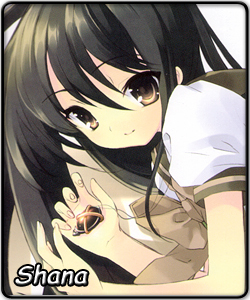 But in Saimoé 2006, another face with another name imprinted her image to Shana's mind... forever. 2006 Korea, Round of 32. Rozen Maiden's Suiseiseki 420, Shana 420. The match that is now known as the Shot Heard Round the Saimoe World, a simple Round of 32 match began a rivalry between Suiseiseki and Shana, which as of now is the biggest individual rivalry in Saimoe. After easy rounds with Konomi Yuzuhara (Negima?!) and Teletha Testarossa (Full Metal Panic), Shana faced Suiseiseki a second time in the semi-finals, and this time, Shana lost to the eventual champion by 187. Her final postition was officially fourth place. Saimoe Japan '06 was merely the same song, second verse. After defeating Aruruu (Uwatarerumono) in the round of 16, Shana went on to face off against Eri Sawachika (School Rumble), the other 2006 Korea finalist. Shana took care of her easily with a marigin of 151 points, but a third rematch with Suiseiseki in the semi-finals have caused Shana to fall short again, this time with a 42 point loss and a consolation prize of third place, and once again, Suiseiseki went on to win the 2006 Saimoe Japan Championship. Despite a double-loss to Suiseiseki, Shana made her name known to the world, and remained a heavy favorite in the Saimoe Circuit. Yet, Suiseiseki wasn't the only girl Shana had to worry about. Shana's 2007 campaign proved to be much tougher. In Japan, Shana had trouble in merely the first round, and slipped through with a 754-754 tie with Evangeline McDowell (Negima?!). Although she shook Evangeline off in the 2nd round by more than a hundred, the match proved to have a negative effect on Shana, as she lost to parallel counterpart Nagi Sanzenin (Hayate no Gotoku) in the round of 16 by only 18 votes. 2007 Korea provided a similar fate with a more successful outcome. Shana again struggled in the 1st Round, losing to Nagi again by only 3 votes in a melee of more than twenty but was still allowed to advance on account of the three per group rule. After a manageable 75-point victory over her third parallel counterpart Louise Francoise (Zero no Tsukaima), Shana completely struggled in the 3rd round, and nearly faced elimination with a loss to Suigintou (Rozen Maiden) and another tie with Setsuna Sakurazaki (Negima?!). And as it wasn't difficult enough, a somewhat managable victory in her round of 64 led to another breath-taking match, this time, crushing Nanoha Takamichi's (Nanoha) hopes of a second title by merely one vote, followed up with a 17-point performance over Maria (Hayate no Gotoku). After an easy win over Nayuki Minase (Kanon) in the round of 8, Shana went up against... you guessed it, Suiseiseki, in their third semi-final matchup. This time, however, Shana was easily prepared, defeating Suiseiseki by 387 points, and went on to the finals for the first time in her career. So she could have won the championship, right? Unfortunately, after experiencing four Hayate no Gotoku representatives, Shana found the fifth, and in a special 48-hour long match, Shana lost to Hinagiku Katsura... by two votes. Still, you can tell that Shana was only getting stronger. Her match losses in order of elimination have been 187, 47, 18, and 2. Hope was not lost for Shana, as she was allowed to take part in the 2007 Korea Super Best Moe. Running on cold feet for a Flame Haze, Shana was the class of the field, blowing away her preliminary group match (though she benefited from a server crash) and winning rematches with Suigintou by nearly 600 as well as with both Hinagiku and Maria by 104 and 241 respectively. Her final match was against last year's representative Haruhi Suzumiya (Suzumiya Haruhi no Yuuutsu), Shana's third 2006 Korea top 4 opponent, and it was kept close match throughout the day, as both have had many similarities. The margin never exceeded 30, and in the end, Shana finally won her first championship by only 17 votes. Despite being preranked #2 in the preseason polls under... well... Suiseiseki, Shana stands out in the group of 64 as the heavy favorite to win this tournament. However, despite having her melon bread antics and the #1 best selling novel series in Japan within her arsenal, Shana faces a tough crowd, many of which she has met on the battleground before, and many of which struggled mightily. However, Shana will not back down, and she will continue to press on in Saimoe history.